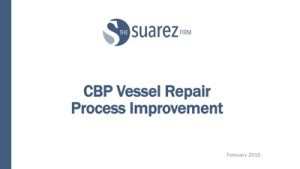 U.S.-flag vessel owners and operators are subject to a 50% ad valorem duty for vessel repairs made in foreign shipyards. Claims for relief that are not adequately presented or documented will be denied relief and assessed the onerous duties. It is therefore important to adopt processes for the collection of critical documentation in support of claims for relief. This presentation provides insight from years of experience with administrative applications for relief, protests and litigation as to best practices in the collection of the documentation and presentation of claims.